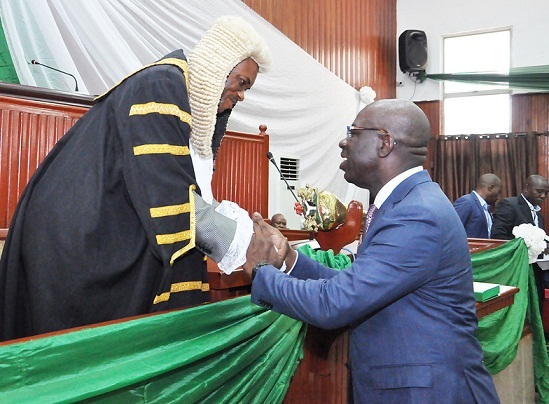 The Edo State Governor, Mr. Godwin Obaseki, on Monday presented the 2019 Appropriation Bill with plans to spend a total of N175.7 billion in the 2019 fiscal year, broken into: Capital Expenditure, N95.8 billion and Recurrent Expenditure, N79.9 billion. Presenting the 2019 Budget Estimates to a session of the Edo State House of Assembly in Benin City, the state capital, Obaseki said: “our budget size for 2019 fiscal year is N175.7 billion, which is a 9.20 per cent nominal increase from the 2018 budget. This budget comprises N79.9 billion for Recurrent and N95.8 billion for Capital expenditures. According to Obaseki, “the 2019 budget proposal “Reflects this administration’s intention to promote social inclusion and economic empowerment for Edo citizens, through the deepening of investments in socio-economic, governance and security infrastructure; and through the implementation of initiatives that guarantee equal access to education, health care and social protection. The governor added that: “Our big-ticket projects, including the Benin Industrial Park, the Benin River Port and Edo Modular Refinery Project, are well on course. N3 billion has been set aside as the contribution of the state as initial investment commitment for the Benin Industrial Park, the necessary preliminary works are ongoing and in no distant time, the first set of companies will set up shops to provide jobs and services in the state. “One of the priority areas of the proposed 2019 capital expenditure framework is to strengthen internal capacity for project execution and governance with a view to achieving 80 per cent closure rate on all ongoing projects. “Much as we are intensifying effort to complete reconstruction of roads across the state, we are also ready to commence new ones to close the infrastructure gaps in the state. Work on the roads will be ramped up during the dry season. Other necessary infrastructure to complement our investment drive will also be catered for. As a result, N42.719 billion has been earmarked for infrastructure development to drive economic activities. “We are also scaling up government investment in socio-welfare enhancement programmes in basic education, primary healthcare and rural development. “On healthcare, N9.328 billion has been earmarked to consolidate on the gains in the sector, including support for the Edo Healthcare Improvement Programme (Edo-HIP), which is targeted at overhauling the primary health care system and setting up modern, solar-powered, efficient Primary Healthcare Centers across the state. “The sum of N1.7 billion has been set aside for primary healthcare reforms. With this, we will be inching closer to the planned 200 PHCs to be sited in wards across the state. “In order to provide funds for our reform in healthcare, we currently save 1 per cent of our statutory allocation to the state and local governments and N960 million is expected to be raised from this and channelled to the health sector. “With the commitment to increase access to quality healthcare, N120 million has been set aside for the Edo Health Insurance Commission, which will be birthed in 2019 fiscal year. “In education, the state has taken giant strides by building an army of digital teachers to prepare our children for the new age of education, one characterised by the far-reaching impact of technology. “As a result, we have proposed N26.8 billion, representing 15.3 percent of the total budget size. It will cater for needs in first and foremost, basic education, which will gulp N6.4 billion. This will deepen the reforms in the sub-sector, provide quality and reliable basic education and prepare our children for the future. “The reforms in other tiers of education, such as the restructuring of the college of agriculture into a tri-campus institution as well as other such initiatives in other secondary and tertiary institutions will be given priority. “Specifically, N1.98 billion has been set aside for the restructuring of the College of Agriculture and Natural Resources. Each of the three campuses are now being tailored to develop manpower with skills to take advantage of the agroecological endowments of the senatorial districts where they are sited. “Our efforts at expanding the state’s economic base will receive a major boost this year as we plan to spend N7.007 billion on investment promotion, which will help bring to fruition a number of our investment initiatives. Through this, we intend to provide guarantee for investments from the private sector, match funding for projects, and provide the right environment for investors to come on board. “Considering the nexus between investment and security, we will reinforce our security architecture with N2 billion which will be contributed to the State Security Trust Fund. We expect that well-meaning Edo citizens and corporate bodies will also contribute to this fund towards ensuring improved safety of lives and property within the state. On job creation, the governor said: “We are poised to realise 50,000 new jobs from ongoing initiatives in Agriculture, Services, Micro, Small and Medium Enterprises (MSMEs) and Technical and Vocational Education (TVET) sectors. “The emphasis of this administration on the enthronement of law and order will be consolidated in this budget year. We will focus on enhancing security and administration of justice, for which we have earmarked N0.967 billion to the Judiciary, Law Reform Commission and the Ministry of Justice. This will enhance the fight against human trafficking and illegal migration, deepen our judicial reforms and ensure that everyone, regardless of social or economic standing, is treated fairly before the law. “All these are critical to our overall vision of unleashing the investment potentials and attracting Foreign Direct Investment (FDI) to the state. As you all know, businesses cannot thrive in an atmosphere of chaos. This is why we are strengthening institutions that promote law and order to guarantee faith in the system and, at the same time, protect the rights of everyone. “To fulfill our commitment towards making Edo the culture capital of West Africa, we have earmarked N500 million in 2019 budget to commence the development and construction of the Benin Royal Museum. This will be done in collaboration with the Palace of His Royal Majesty, Omo N’Oba N’Edo Uku Akpolokpolo, Oba Ewuare II, Ogidigan. “An entertainment park that will host the creative arts, film and television productions, is being embarked upon. It is designed to tap into the fast-growing industry by harnessing the creative talent of the Edo people, attract investment and create jobs. To this end, N500 million has been set aside for the project. “We continue to appreciate the labour of our senior citizens whose sweat built our state and its institutions. Therefore, we take the issue of pension payment as our utmost priority. In 2018, we have spent N8 billion in pension payment. We plan to spend another N9 billion to pay pension, gratuity as well as arrears owed from previous years. Reviewing economic developments in the outgoing year, (Domestic Macroeconomic highlight 2018), Obaseki explained that “In the first six months of 2018, the Nigerian economy recorded improvements that were engendered by increasing business activities, rising oil prices in the global market, increased domestic oil output and declining inflation. “As a result of uncertainties which were triggered by the late passage of the federal budget, GDP growth rate slowed down from 2.11 per cent in the last quarter of 2017 to 1.94 per cent in the first quarter of this year. Economic activities however remained buoyant, with manufacturing purchasing manager’s index (PMI) as measured by CBN, closing at 56.8 in October from 56.3 in February 2018. (The PMI is an indicator of economic health for manufacturing and service sectors of the national economy). “Our expectation for growth in 2019 is an expansion of 2.5% in GDP, an improvement over the expected growth of 2.1% in 2018. While crude oil price may decline, we hope that the increase in oil production to 2.3mb/d due to additional output from areas like the Egina field, will sustain growth in the oil sector. “In the non-oil sector, we expect a sustained positive performance in manufacturing and services due to higher consumer spending (as higher government revenues which are ensuring the settlement of outstanding salary obligations across states and a new minimum wage, will boost household income). In agriculture, we expect a boost in 2019 as governments move to enhance stability and productivity in this sector. On Inflationary Trends, he said: “By the end of fiscal 2018, we expect inflation to average 12.3% monthly, an improvement from 16.5% in 2017. “Experts forecast a slight deceleration in inflation to 11.0% in fiscal 2019, as the results of various Presidential initiatives around food security, petrol and electricity supply/pricing begin to materialise. On External Reserves and Exchange Rates, the governor noted that, “In 2018, stability and convergence in exchange rates has been achieved and sustained. “Although we’ve experienced pressure on external reserves due to capital flow reversals resulting from higher interest rates in advanced economies, political risks domestically and increased interventions by the CBN to keep rates stable; our external reserves has grown from about $29 billion in May 2015 to about $48 billion in May 2018. “With expected proceeds of US$2.9bn from the latest Eurobonds issuance, we believe the CBN has more room to maintain stability. Hence, we expect exchange rates to trade around the current rates of N360.0-365.0/US$1 in both the parallel market and the Investors’ and Exporters’ (I&E) window.